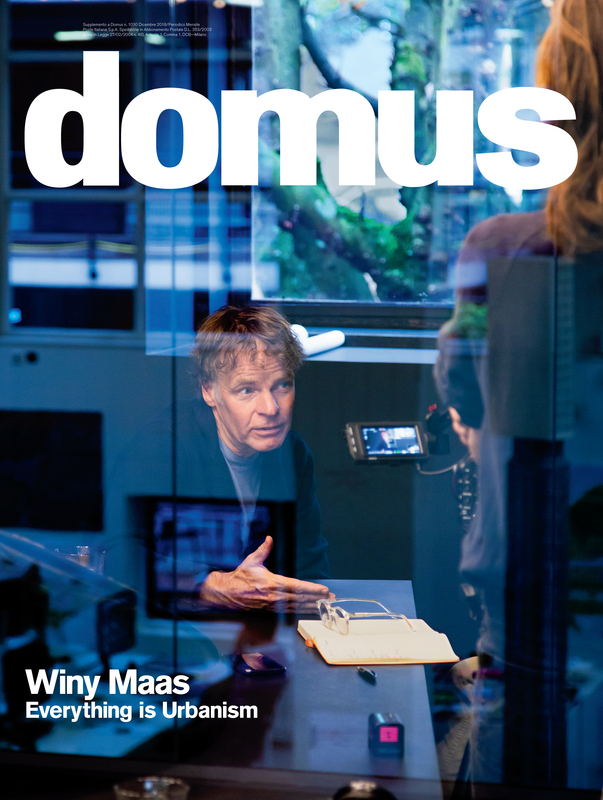 Today the seminal architectural publication Domus presents its new director: Winy Maas. The MVRDV principal and co-founder will head Domus for the upcoming 10 issues as part of the magazine’s new 10x10x10 editorial strategy. Maas is the second Editor-in-Chief selected as part of this 10-year plan, following in the footsteps of Italian architect and designer Michele De Lucchi. Domus, the seminal architecture, design and art publication, was founded in 1928 by the notorious architect Gio Ponti. Last year, the publication kicked off the Domus 10x10x10 project: an unprecedented editorial format in which 10 internationally acclaimed architects will direct the magazine for 10 issues each over the upcoming 10 years. It will be a long, yet peculiar and surprising journey, which will accompany the magazine until its centennial in 2028. As the newly appointed editor in chief, Winy Maas launches a positive vision, a dare to change and a stimulus to intellectual and collective responsibility: "We need an agenda for change. Our planet is subject to dramatic climate changes that require all of us – politicians, urban planners and citizens – to accelerate our action to save it. But we are still too slow. Domus will act as such an agenda”, Maas announces in his manifesto of intent, published together with the special monograph dedicated to him and included in the magazine’s December issue. Throughout 2019, Domus will be entirely dedicated to the city of the future, a city that is born out the dialogue and the contamination of all the disciplines that operate within society. The aim of this new direction is to pose multiple questions and to find multiple answers, giving voice to all those who make, think, plan and live the city. Together, the 10 issues will form a single volume, comprising over a thousand pages, which will become an instrument for evaluation and research and will help illustrate the contemporary zeitgeist. "Can our cities surprise us? Can they be more responsible? More open? More curious? Brave and experimental? Truly green? Bio-diversified? Human, social, intimate, accessible, free, heterogeneous? Different? Can they be pleasant, beautiful, exciting? That is my plan,” Maas further states in his manifesto. “Better materials, better bathrooms, better facades, better houses, better cities and a better world, which ranges from the mass production of cars to bricks, from roads to infrastructure, including nanomaterials and large-scale planning. All of this will contribute to building the city of future, and Domus will be the one to tell about it." Winy Maas will be assisted by a Rotterdam-based editorial team comprising Javier Arpa Fernandez, Jan Knikker, Claudia Mainardi, and Rory Stott, who will work alongside the Domus editorial team to realize Maas’s vision. The first issue of Domus will be available at newsstands and in all the best specialized bookshops both in Italy and abroad, starting from the beginning of January 2019. Read more about the appointment on the Domus website. Photo by © Barbra Verbij.